THERE is genuine regret throughout local rugby circles after Munster Rugby announced yesterday that talented winger Ronan O’Mahony has been forced to retire through injury. Ronan sustained a broken leg and dislocated ankle when playing against Treviso in April 2017 has been advised to retire from professional rugby on medical grounds. Commenting on the announcement O’Mahony said: “I’m heartbroken to be finishing my career earlier that I had expected. The last two years have been pretty tough since initially breaking my leg, and ultimately the injury has made it impossible for me to continue. I take great confidence in knowing the medical team and I have given everything to this and we have done everything possible in looking to regain full fitness. However, it’s a battle that I’m not going to win and as such I have been forced to call it a day. Ronan comes from a deep rugby tradition in Limerick and, like other members of his family, is deeply involved with Garryowen FC. His grandfather Frank, dad Gerry and uncle Frank were prominent players with the light blues and Ronan’s brother Barry was also forced to retire when he was on the Munster squad. 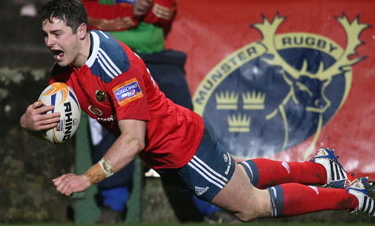 O’Mahony, who turns 30 next month and before his injury was the Munster’s leading season’s try scorer, made 70 appearances for the province after making his debut against Dragons at Rodney Parade in April 2013. He went on to make his European debut against Saracens in January 2015. In scoring 21 tries he was the leading joint try-scorer for the 2016/17 season with 11 tries, crossing the whitewash in Munster’s historic win over the Maori All Blacks in Thomond Park. We wish Ronan well in whatever pathway of life he chooses and hope that he will continue to be part of the rugby game in the years to come.